If you live in New York or Washington, or perhaps other cities in the United States, it's likely you witness (and perhaps wear) a profusion of Burberry items daily. In certain areas, the frequency of Burberry scarves approaches comic proportions, and no one ever seems concerned about the fact that everyone is wearing the exact same scarf. This led me to the idea of having a Burberry-spotting game, with a point system devised by a New York resident I know (who also took this photo). The point system is as follows. And then, of course, just when it seemed the game was taking shape with a solid framework, something came along to challenge our notion of just what's possible in the realm of Burberry achievement: the full-on plaid coat in the photo. Now we are wondering, how many points does this baby merit? Is it a 1,000-point score? Or is it more of a "bingo" sighting, one that doubles whatever your current total is? Another slight flaw here is that, as spring approaches, scarves will wane. We need another ubiquitous, low-scoring item for the warmer months. If you choose to participate in the Burberry game, please do share your results. I like to play over the course of an outing or a day, but imagine how many points you could tally in a whole week. 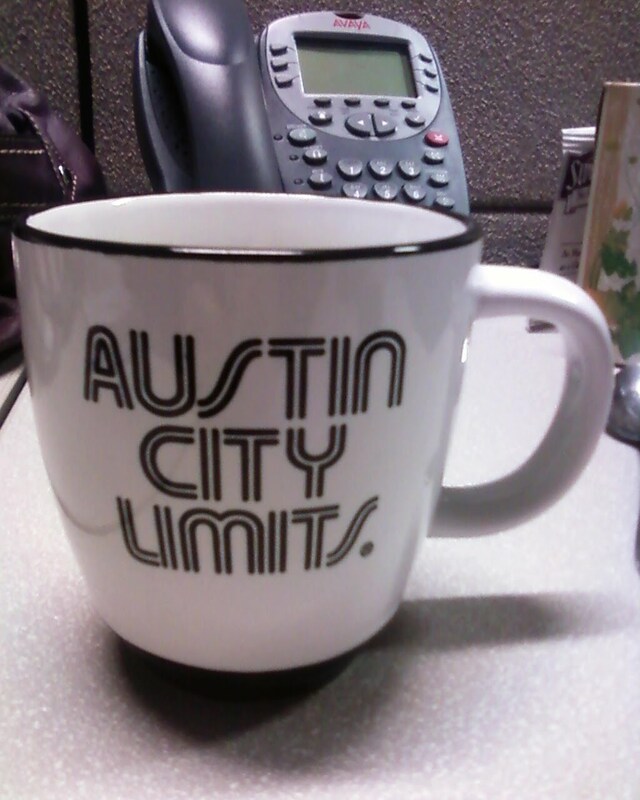 Witnesses to my previous office mug will agree that this new one, a gift from a recent participant of SXSW, is a nice improvement. It meets my mug standards regarding interior color, capacity and heft; it's also appropriately meaningless and random in its message. No one, however, commented on my mug when I introduced it in meetings recently. I am not sure what to make of this, unless I infer that no one else cares about my stupid mug except me, which is obviously an inadmissible conclusion. You don't need the tag line "Not your grandma's phonebook" to glean that Spokeo is unlike any phonebook you've seen yet, if by phonebook you mean powerful stalking tool. Simply look yourself up for proof. More unsettling than the amount of bizarre data on oneself (hobbies?) is the reckless inaccuracy. According to Spokeo, I still live with my parents and am still married. The good news is, I also own my parents' home. Alright -- alright. Let's just settle down. Here's the thing: There are rules to parking lots. The rules are that the spots for disabled people are in the very front and that you never park in them unless you have the proper credentials, that you park between the white lines, and that you may not hit any pedestrians even when they walk slowly through the middle of lanes meant for vehicles. The grocery store in question throws a curveball to the status quo by designating special "parents only" parking spots, which lie tantalizingly close to the store but not quite as close as the wheelchair-sign spots. This means that on any given evening, an unsuspecting non-parent can be cruising through an aisle and think, "Oh cool, I'll park here," because it's a pretty close spot and there's no intuitive reason you wouldn't park there -- until you turn into the spot and encounter the pictured sign. With all due respect to the parents I know, this is wrong. Being physically incapacitated by a disability or illness entitles someone to better parking than me. Being slightly encumbered by a less-mobile human -- one you created -- entitles you to the lifetime of inconvenience (and, of course, unspeakable joy) that you signed up for. That's just the way it is. Come on! Finally, I salute you with one of my all-time favorite depictions of spring, taken at the venerable Duane Reade drugstore in New York City (RIP). I wish you a happy Easter, a happy Passover, and allergy-free warming trends. Music: "Sometimes It Snows in April"
With all due respect to the parents I know, this is wrong. Like, OMG! Like, what's with these breeders? LOL! Like, why should I have to walk ten feet farther than them? OMG! Gag me with a spoon! By the way, that's exactly how I talk. By definition, those of us who don't have kids hate "breeders" (that's what we call them) and we speak like teenagers (teenagers from the '80s, even) when we express a viewpoint. Nothing says Spring Is Here! Like that trio of warped wabbits. I guess 'breeders' and their filthy children should be entitled to more than us non-breeders. Such a sign would amount more to a suggestion than an enforceable rule. I recommend asserting your rights as a Singleton by helping yourself to the spot and leaving the Moms with kids and strollers to park further away. You know. Fight the power. that's totally at a wegman's isn't it? the shoppers there are intense. It is a Wegman's, yes. Which I love! But as I said, come on. KPCK, totally sympathetic to that. My workplace has special parking for pregnant women and I think that's nice. It's more the blanket "if you have kids you get a special space" thing that gets me. Obviously my viewpoint offends some, but so be it. Certainly my hat is off to Wegman's for shrewd marketing. Anyone who has just had surgery, be it a c-section, hernia, knee replacement, or whatever should be entitled to a handicap sticker for the length of their recovery, this would place kpck's example in the proper context.